J.M.B. Scott of Brasenose College accompanies a race during Summer Eights in Oxford in May 1946. Seventy years ago, the image above could easily have been taken for an East End hoodlum running from a bank heist somewhere in London. In the current age, it evokes other fears, sadly more sinister and arguably more common. Looks can be deceiving, however, for the subject was neither a bank robber nor a crazed extremist, but an Oxford college oarsman running alongside a race in Summer Eights in 1946. But what was he doing running around with a loaded pistol? The answer lies in the peculiarities of bumps racing in Oxford and Cambridge. Both universities lie astride rivers too narrow to race side by side, so competing crews start one behind the other with the objective of hitting the boat in front – and avoiding being bumped by the one behind – before crossing the finish line at the other end of the river. The problem is that it is very difficult for coxswains in eights to see just about anything directly in front of them, especially when the crew is composed of well-built oarsmen directly before, and somewhat higher than, the cox’s cockpit. It is even harder to judge the distance between the bows of your boat 15m away, and the stern of the boat in front. To make it easier, colleges used to rely on “gunmen” to accompany their crews. They ran along the towpath and fired pistols into the air to signal pre-determined distances between their college’s crew and the one in front. For example, one shot might indicate the gap had narrowed to half a length, two shots for a quarter of a length, and three shots for an overlap. Needless to say, with every race entailing twelve crews, each chasing after the one in front, the sound of a race coming up the river would have seemed somewhat like a gunfight at the OK Corral. 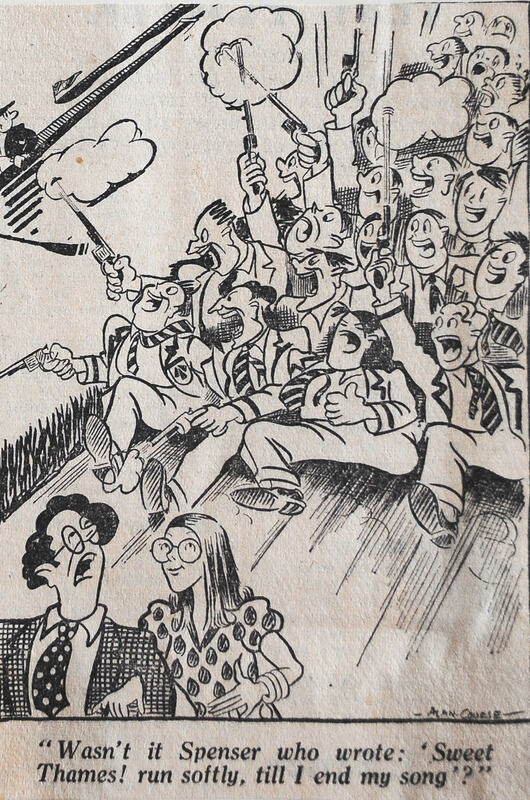 A cartoon from the “Oxford Mail” in 1946 made light of the horde of ‘gunmen’ in blazers and ties running along the towpath as they followed each race. The number of rounds fired could sometimes be disturbing. ‘Gunmen’ from Brasenose College fired almost 300 rounds as they signalled to their crews during the six days of racing in 1946. As pistols were only fired when crews closed on the boat in front, the total number of rounds fired during the regatta could be taken as a measure of the success of a college’s boat club. It is unclear when the use of pistols first became prevalent among Oxford or Cambridge college boat clubs. However, the Minute Book of the Brasenose College Boat Club in 1870 records a resolution authorising its Treasurer to buy two pistols for the purposes of starting the College’s own races, and presumably to signal to crews as well. At some stage between the late 1940s and the 1970s, the practice of using pistols to signal to crews passed into abeyance, to be replaced by whistles and horns. Not only did they pose much less risk to spectators and competitors, but they were cheaper as well. Pistols may be no more, but the noisy throng of whistles and horns that portends the approach of a bumps race still sends shivers up the spine of anyone who has pulled an oar at Oxford or Cambridge. Long may be this so – three whistles to signal a canvas to go!!! Gunmen were still standard practice in Oxford bumps races as late as 1974. I still have an empty cartridge case which our college gunman gave me as a souvenir after we made a bump in front of the boathouses that year. My recollection is that gunmen totally disappeared either the following year or the year after that. I was told that the police put a stop to it because they were worried about students running around with guns – even if they were only starting pistols that fired blanks. No doubt the police’s attitude was influenced by the IRA’s bombing campaign: the Guildford and Birmingham pub bombings were in late 1974.